We're just back from a fantastic trip to Southern California and I'd like to share what I found for discounts at the theme parks and resorts we visited. It drives me bonkers when I leave money on the table by not taking advantage of the best discount possible, and it never ceases to amaze me how some of the best discounts are the most peculiar. Our profile: Two adults, two kids (8 and 5 year old boys as of this post) travelling from Massachusetts for a week-long stay. We're not going back to California again this year (as much as I'd like to) so annual passes, for the most part, aren't viable for us. I've entertained some annual passes that work for parks in California and Florida but haven't found them to be tremendously advantageous for our situation. Read on for the best discounts and angles I could find and let me know what you've found that works better! Without a doubt, Disney Parks are the hardest places I've found to get discounts. Kind of like Apple, they do a fine job of maintaining the integrity of their pricing structure by minimizing the availability of deep discounts. One angle I considered during the booking process, that has the potential to work for a variety of situations, is buying Disney gift cards at a discount. Target had a deal going last year where you'd get a $10 Target gift card if you purchased $50 worth of anything in the store, and gift cards qualified. It was a high involvement slightly shady technique (how many trips to Target would you have to make, and how many $50 gift cards would you have to redeem when you arrived at the hotel?) but 20% off your entire Disney vacation had people willing to do crazy stuff. Read more about it here in this massive thread on DIS Boards. Also, though it's not the best redemption rate, many credit cards let you use points for Disney gift cards. Disney gift cards can be used at Disney Parks, Disney Cruise Line, and at Disney Stores across the country. Nice broad usability, unlike iTunes gift cards (for example) which can't be redeemed at the Apple Store. The lodging portion of the Disney stay is probably one of the easier parts of the Disney vacation to get a discount on. 20%-30% offers seem to come up fairly regularly. I think I got 20% off the room by way of a promotion code my sister in law shared with me. Staying at a Disney Parks hotel seems to put you on a list for future offers, and it also gets you into the parks early. With Extra Magic Hour, guests staying at one of the Disneyland Resort hotels (Grand Californian, Disneyland Hotel or Paradise Pier) get into either Disneyland OR California Adventure an hour earlier than the general public. We bought park tickets bundled with our hotel stay and they accounted for 60% of the total bill. As much as I wanted to get a discount on park tickets I didn't see a significant angle. Perhaps a few dollars off with AAA. The model with park ticket pricing is the longer you stay the cheaper it is per day. But the longer you stay the more you spend on food and merchandise (not to mention lodging). One angle is to get the Disney Dining Plan but I don't like to lock us into anything. What if the kids are sick and the day gets derailed? Or what if I want to grab something quick off site? I like to keep our options open so I didn't go for a meal plan. So we just ate a la carte. But upon returning home, I just realized I left some money on the table here. 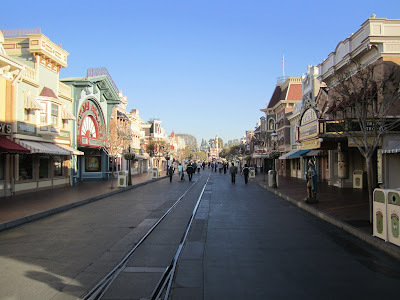 We have an old no annual fee Disney credit card that gives you 10% off a lot of the restaurants and retail shops in Disneyland, including several we spent quite a bit of money at. I was confused about which venues it worked for in the past, so I filed the card away and haven't been using it. But if I were to do it again I'd bring the card with and give it a shot. Park review: Fantastic. 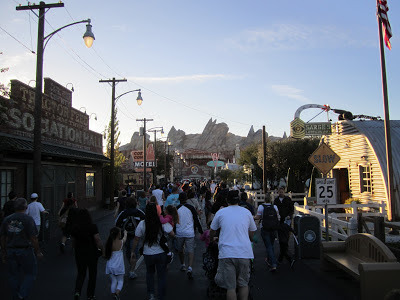 Disney continues to run their parks very well and we all enjoyed Disneyland a bit more than Disney World 3 years ago due to the kids being a bit older and more into it. Related reading: These Disney Cruises Infuriate Me - Why Do I Keep Booking Them? This was our first visit to Legoland so I wanted to see how we liked it before buying a multi-day or annual pass. 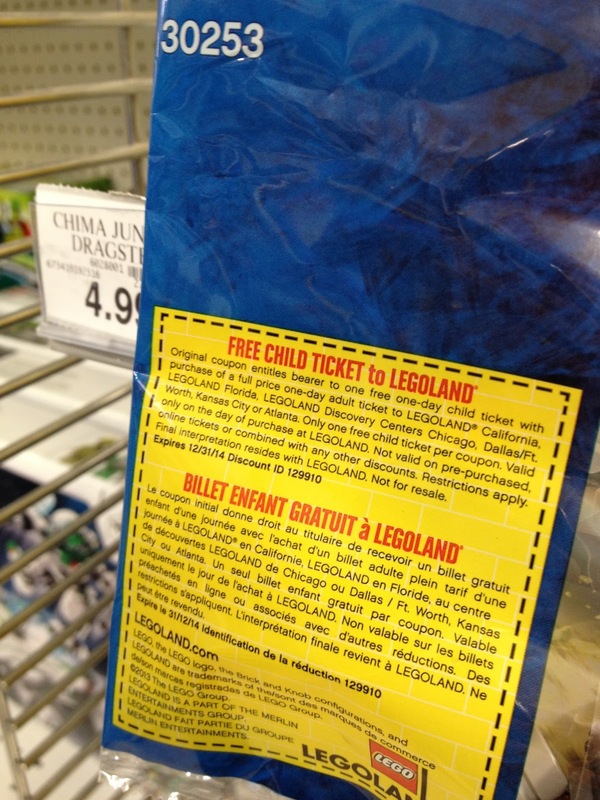 This thread on DIS Boards about Legoland Coupons/Discounts pointed me to my local Toys 'R Us to find a free child ticket to Legoland with the purchase of an adult ticket on the back of $3.99/$4.99 Chima/Batman toys. How crazy is it that their $4 toys have a great coupon like this and their $100+ toys don't have much of anything to reward you for a massive purchase? This "buy one get one" kind of discount works great for our situation and is much better than a percent-off coupon. I hear they have these at Target too. But if you find yourself in line at Legoland without a coupon, here's a Pro Tip: Buy one adult ticket and go into the park. 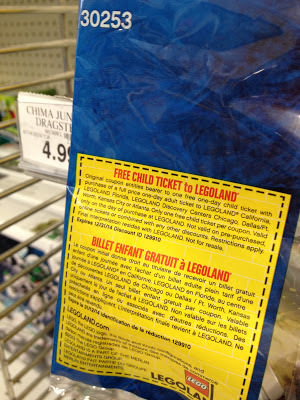 Go to The Big Store (the Lego Store within Legoland) and look for these toys and coupons. As of February 2013 they had them. A good thing about these passes is that for $20 per ticket you could upgrade everyone's visit to a 2nd day. Park Review: Quite disappointing. Our kids love Legos but I felt like we were there for them rather than to enjoy our vacation with them. A few of the rides did a good job of integrating Lego themeing but many attempts felt half-hearted. Once the whining started I didn't feel much motivation to stick around. The park makes too many attempts to grab additional money for attractions once inside. Carnival games and such were sprinkled throughout the park so they couldn't be avoided en masse. A mini-golf course for $5 per person particularly annoyed me: I paid at the gate! Also, I was disappointed I couldn't use my Lego VIP card for purchases within the park. Lego VIP cards give you 5% back towards future purchases. They said the card couldn't be used because the parks weren't owned by Lego. They parks are now owned by Merlin. The Volvo Driving School and the Police and Fire Academy were cool but we left at 12:30 and didn't feel the need to come back for more. I was seriously tempted to buy the Sesame Place Super Grover Pass late last year when it was 25% off. Sesame Place is owned by the same folks that own Sea World, Busch Gardens and Discovery Cove. It entitles you to admission to Sesame Place (which I might never go to) but provides a cheaper way towards an annual pass to all of the Sea World Parks (San Diego, San Antonio and Orlando) plus free parking at Sea World, discounts on food and merchandise, and reserved seating at shows. The best time to get an annual pass is in the fall when it's good for more than 12 months, especially considering that's when the Super Grovers are maximally discounted. I can see us going to San Diego and Orlando in the same 14 month period perhaps as many as 3 times so I'll keep this option in mind for future years. The best single-day discount I could find was 20% off at the gate (not available online) with a Southwest Airlines Rapid Rewards card. 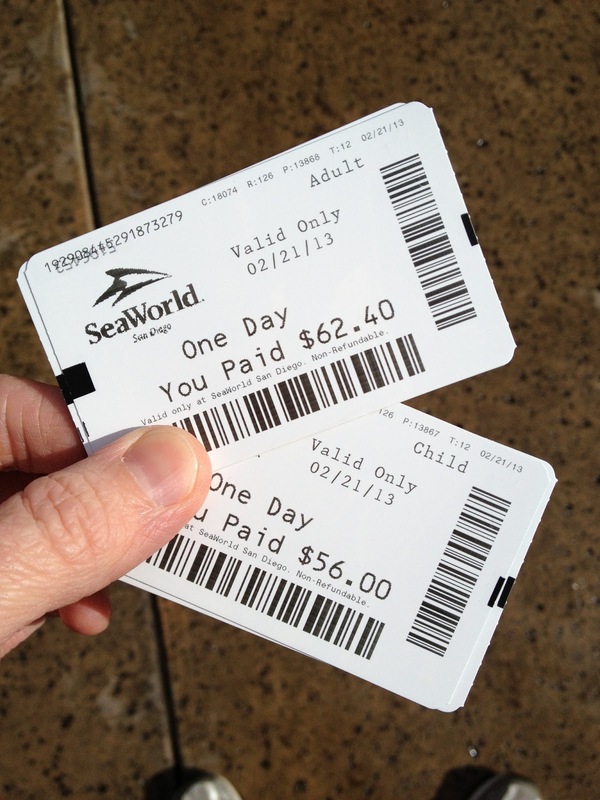 This discount isn't widely advertised but I confirmed it by calling Sea World ahead of time. It was still valid as of February 2013. If you don't have a Rapid Rewards card number you can get one for free and print it out before you go. My Chase Southwest Rapid Rewards Visa happens to have my Rapid Rewards number on it (and it also happens to offer a highly usable 50,000 point signup bonus - more on that and 270,000 other signup bonus points here). No discount on parking ($15), food (kind of mediocre but I do like Dine with Shamu if you haven't done it before, especially if you're visiting the Orlando park which includes all you can drink Budweiser products in 16oz aluminum bottles which sell for $6.99 each in the park otherwise) or merchandise (quite fairly priced compared to Disney in my opinion) with the Southwest angle so factor that in when going the single-day route. Park review: Absolutely fantastic. This is the 4th time we've visited a Sea World and it has been thoroughly enjoyable every time. Something about the pacing of the parks (shows/exhibits/a few rides) and my affinity for marine mammal shows that seems to work out well for us. Your mileage may vary of course. This place is absolutely, without a doubt, the best family friendly luxury resort value in the United States. This was the third time we visited and although the adjacent hotel is now a Park Hyatt rather than a Four Seasons, the experience at the Four Seasons is still first class. The first time we stayed it was on a timeshare preview weekend directly through Four Seasons. I was so "under the ether" I was ready to plop down $25k+ per week to buy one but Deanna talked me down off the ledge. I'm glad she did because timeshares are a much better buy in the secondary market, and Four Seasons Residence Clubs have a very high maintenance fee on the order of $2,400 per week per year. The next time we rented through TRI West - a timeshare broker who has a lot of units at Aviara for rent and sale. It was an easy transaction and went off without a hitch. This time we went through a private party on RedWeek.com. 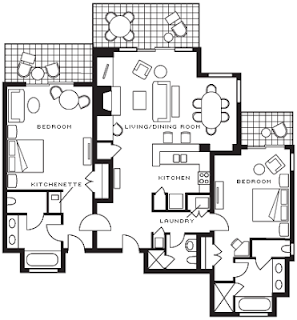 TRI West was asking $2,395 and I was able to get a week in a 2BR from an owner on RedWeek for $2,150 for the week. A fantastic value for 7 nights in a 1,600sf villa that includes Four Seasons service. If you'd like to stay for less than a week or want to keep the transaction simple you can book directly through Four Seasons. What I've found while obsessing over watching rental weeks at Aviara is that if you're date flexible and/or opportunistic in when you visit, you can snag a week for less than the annual maintenance fees. Why would you pay to own when you can rent for less? You shouldn't. And that's why we rent. Until rental prices start trending significantly north of the maintenance fees plus property tax I'll continue to be a renter. Or maybe I'd be a buyer if Four Seasons builds out their network of Residence Clubs to include more properties you can trade into (Scottsdale is the only other location that's viable, although they do have other Residence Club locations which are more true fractionals). 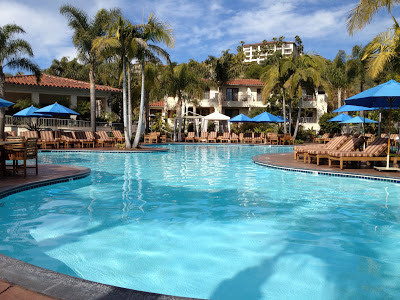 Four Seasons Aviara Residence Club Review: Perfect once again. Paradise on earth. I'll follow-up with a full review of Aviara specifically. Subscribe for notifications of new content. I was pretty proud of myself when I bought a couple pretzels for the kids at Wetzel's Pretzels at Seaport Village, used my AAA card for 10% off and got parking validation. But then my sister-in-law found a FourSquare check-in that led her to a discount booklet that included buy one get one free pretzels and other discounts. Another option to consider if you're planning to visit 3 or more attractions in the San Diego is the Go San Diego Card available on Costco.com. I liked the savings associated with this card, and it includes all of the big attractions like Sea World and the San Diego Zoo. But the clock starts ticking as soon as you visit the first venue and you have to visit others on consecutive days to get maximum value out of the card. I like days of rest between visiting big attractions, and I don't like to lock us into something ahead of time (weather/sickness contingencies) so I skipped this option. Question of the Day: What angles did I miss? Let me know for next time - I'd love to go back in a couple years!